I read a lot of articles by fellow wargaming bloggers. There’s a large list you can find by checking out the blogroll. However, there are some wargaming bloggers that I read more frequently than others. These are the bloggers I will go out of my way to make time for. Each of the wargaming bloggers are unique, but there’s one commonality with them all. These folks write approachable content, and they will engage the community. Basically, these are the people I would go have a few beers with, and chat hobby stuff with. So, I wanted to take a moment to promote these guys, and maybe you’ll discover a new favorite blog in the process. I’m going to list these in alphabetical order since my intent is not to rank them. I’ve come to know Joe over at Broken Paintbrush quite well. In fact, I even do some guest blogging over there from time to time. 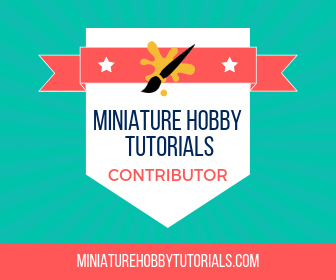 Anyway, Joe has a wide range of articles, including tutorials for general hobby work and painting. Hell, he’s even written a book about it. He’s a great guy, really positive, and his blog is awesome. I love Chaos, and Castigator has a TON of really great Chaos stuff he works on. He has a Slaanesh theme with his army, a rare choice among the pantheon these days. There is no shortage of well painted models to be found on Catigator’s blog, and not to mention great conversions. The other thing I really enjoy about Castigator’s Chaos is the amount of fluff he writes for his army. You can find back stories to many of his characters, which are very well-written, as well as narrative games. When you put together a great looking Chaos army, with great fluff, you have my interest. You will see Tibbs listed down below for his blog, but Chapter Approved is a podcast he does, and a great podcast it is. Chapter Approved is the only podcast that I listen to. The reason for that is because Tibbs does an amazing job producing a casual, hobby-centric podcast that I have not seen previously. The other great thing about the podcast is that each episode is only around 30 minutes in length. As a busy person, as most of us are, having something enjoyable to listen to that’s only half an hour in length is perfect for me. I strongly recommend you check it out. I first came across Greggles when he became a frequent commenters here, and he remains one of the most frequent commenters today. Greggles Tabletop is focused on his favorite army, Orks. They also happen to be a favorite army of mine, despite a terrible codex, and so my interest was raised. Greggles’ passion for Orks is infectious. He does a lot of work in progress posts, and of course showcasing his completed projects. His work with weathering on his Orks is awesome. The amount of steps involved to pull of what he does is staggering, yet the results cannot be argued with. The other thing I enjoy about Greggles’ blog is that he adds a touch of intimacy. He will blog about personal things, and events he’s attending and the people he has met. I guess it feels less like a blog and more like you’re talking with someone. I first discovered Kujo on Twitter years ago. I was always impressed with his painting. Kujo has a way of making something look easy that you damn well know wasn’t easy to do. He’s also very humble and just a funny guy. Unlike the others on this list so far, Kujo does most of his work on YouTube. He has some seriously amazing tutorials, showing exactly how he does the magic he does, as well as awesome videos covering color theory, lighting theory for NMM, etc. Basically, you can learn stuff and learn the logic behind the things you learn, which I love. Anyway, definitely check out his videos; you won’t regret it. NafNaf is an amazing sculptor, so much so that he’s creating a Dark Eldar & Eldar army that’s entirely sculpted and converted. It takes a lot of dedication to make every single model in your army unique, and to look great at the same time. The best part of all of NafNaf’s work is that he has created a dark carnival theme for his 40K army. Jesters, clowns, and all things carnival and eerie, are a part of the amazing theme he has created. His army is easily the most unique one I have seen, and it all just looks great. Also, he’s created a really incredible Sylvaneth army for Age of Sigmar. The Sylvaneth army is also fully converted, and just looks awesome. Rory lives on an island, Ireland, and the poor guy can’t manage to get in any 40K games. The inability to play 40K has not stopped him from working on his Thousand Sons army though. I enjoy watching Rory slowly build up his army and get it painted. I’m a big fan of themed armies, regardless of the theme, and of course I love Chaos. Rory is also a big time commenter here, and likely how I discovered his blog, I can’t recall for sure. Also, Rory has also done a guest post here, so he’s part of the family. Tibbs gained a lot of popularity with his amazing Imperial Knight, the Queen Bee. His paint scheme for the Queen Bee was put into the Freeblade IOS game; that’s how popular it was. It really is a piece of work. There is a lot of really great stuff to be found on Tibbs Forge. His painting is top-notch, but he also has some really great editorials. He, like the other being listed in this article, is very quick to respond to comments. Tibbs is great at creating a conversation with his readers, something that sadly many bloggers fail to do. Just scour his blog, you’ll find no shortage of fantastic stuff to look at and read. Wargaming Tradecraft may just be the blog on this list that I have followed the longest. Anyway, Dave is a very talented artist. Note my use of the word artist. I say that because Dave really knows a lot when it comes to things like color theory and composition. He’s not just putting brush to model, he’s making extraordinary pieces. That being said, the reason I follow Wargaming Tradecraft is for all of the resources he gives the community. Dave is always putting out tutorials on various painting techniques and hobby tips. If you want to learn how to do something then odds are it’s on this blog. This is another blog I have followed for a very long time. Rob is the creator of Old Stuff Day. He also has a TON of Tyranids, and he likes Ultramarines (boo!). Basically, Warhammer 39,999 is very much like this blog. Rob is just a guy chatting about the stuff he’s working on, and periodically sharing his thoughts in an editorial manner. It’s a shame he lives way up in Alaska because I’d love to get in a game or two with him. Warhammer 39,999 is a very down-to-earth blog and well worth checking out. If you have some favorite wargaming bloggers that you’d like to promote, please leave a comment below. Wow! Thanks! I appreciate the kind words. I’m always afraid to do articles like this because I feel like I’ll miss someone, or someone will be upset they weren’t included. However, by not doing something like this then I can’t share the blogs I feel everyone should check out. In the end I decided I would rather share than fear upsetting someone. Just do another article later to catch the other ones. No problems there. I will eventually get a game in! I’ll faint when I see a bat rep on your blog. Surely some other blogger will come to my aid to force Thor into a faint, right? I’ll all beaming all over the place. I may have taken out part of a city, or a planet. Now, you just have to get back into the blogging groove. How’s the back holding out? Back doing better. Got Dr appointments up the wazzo. Also did the paint judging at the tournament this past weekend, so that should help with the grooving as well! Thank you so much for the kind words mate. It’s very heartening to know that somebody enjoys reading my ramblings. You’ve made my week…..cheers buddy! I think we all feel that way honestly. Just amazed that anyone reads the stuff we throw out there. No offence to the other guys! but I got to say that the Wargaming Tradecraft Website is one of the best ones out there! I must be on the right track. I frequent most of those sites. There’s no shortage of great blogs out there, it’s just hard to find them sometimes, which is why I like doing a post like this. For sure. That’s how I was brought to Creative Twilight. I’ll give credit to Greggles because I am sure he did a post similar to this one and your site made the list. I’ll get around to doing a post like this soon (and again and again, lot’s of good sites out there). You should check out Tabletop Apocalypse. http://tabletopapocalypse.blogspot.co.uk/ Blazmo does great conversions and his paint jobs are supreme! Funny you’d mention that. I came across his blog a few weeks ago, and I’ve added him to my blogroll :) He does have some awesome stuff there. Still digging through it all. Some great blogs and me as well. Good stuff. Cheers for the thought chief. Thanks for the mention Thor! Great list here for sure. I know I don’t post as nearly as often as I’d like to, but I try not to let that impact the quality of what I’m writing. I know what you mean. My blogging has dropped off a lot, as has my hobbying. That’s a reason I’m reviving this – if I can’t blog or hobby then I may as well promote. Greggles does have some awesome stuff. I love his weathering techniques. Thanks, and they are all great guys.